Phytomedicine reports on a pilot study that seems to corroborate the idea that regular consumption of cranberries (or cranberry extract / juice) can help prevent recurrent urinary tract infections (UTIs). 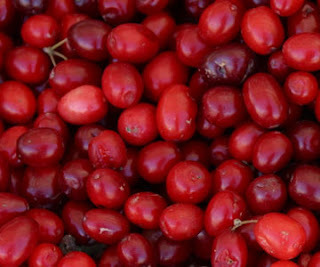 Though the study followed only 12 women, it selected those women based on frequency of UTIs (6 over the last year) and followed them for 12 weeks of cranberry therapy. The results: none experienced UTIs during the 12 weeks of the primary trial. The women were followed for 2 years total, and 8 continued with the cranberry extract during those years. None of those taking the cranberry had a UTI during the follow-up time either! Previous research seems to point to cranberry's ability to limit bacterial adhesion and the formation of bacterial biofilms in the urinary tract (and oral cavity, by the way). Adding this new, in-vivo information to the mix might help not only to relieve the often painful and distressing symptoms of recurring UTIs, but also to reduce the administration of potent antibiotics like Cipro.